Last Saturday I came down with the flu, which was no fun for my first week of work. But on Wednesday my fever finally broke, and today, except for a lingering cough, I’m pretty much back to normal. While I was sick, I learned that there’s a complicated system of rules here about what to eat, drink, and do to get over an illness. When I was growing up, I heard a few rules outside the scope of modern medicine that instruct you on what to do when illness strikes. For instance, my mom always told me to drink thyme tea to treat a cough. In Nepal, though, there are many superstitions and rules about what you are and are not supposed to eat, drink and do while sick. In an attempt to avoid the doctor, Tri and I were doing some researching online about how to deal with the flu. We read that drinking ice water is better for bringing down a fever than using wet compresses (because those can make you shiver and actually raise your fever), so I decided to try it out. When his dad saw me drinking chiso paani, “cold water,” he was horrified, and prohibited me from drinking anymore. Anything cold is apparently a big no-no. The next day, at my sickest, I was lying on the couch watching TV, but Tri’s brother quickly told me that doing so would only make my fever worse. I also wasn’t supposed to eat yogurt or greasy food, and oranges and other juice-filled fruits were off-limits as well. Yogurt and fruits are considered to be chiso, or “cold.” Many Nepalis believe that the cold causes sickness, as do things that are thought to cool the body like yogurt and fruit. In fact, I was sitting on a cold concrete step a few weeks ago, and my friend told me I had better get up or I would get diarrhoea. I’m not convinced that this works to heal the internal organs, but I definitely believe that massaging certain pressure points can relieve things like muscle pain and blocked sinuses. I’ve only mentioned traditions that I know are practised in Kathmandu, but there are many different ethnic groups in Nepal that have different practices surrounding healing. When I was studying here two years ago, I lived with a Sherpa host family in the Dolakha District, and they used a jankri, or “faith healer” to cure the ill. He would burn incense and use a variety of different plants while chanting prayers over the sick. I can’t say that I liked having the flu, but I did learn a lot about Nepali culture this week. 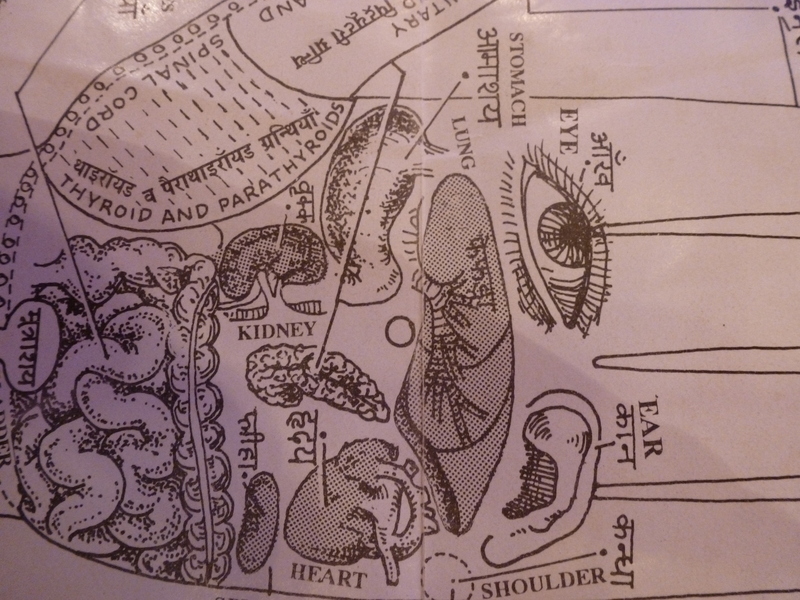 This entry was posted in Health and Sickness, Nepali Culture and tagged Acupressure, Healing in Nepal, The Flu by nepali jiwan. Bookmark the permalink. Your post rings so true! The last time I was in KTM I had a cough from hiking up in the mountains (and probably also from coming back down to smoggy KTM). Even though it was boiling hot P’s mom refused to let me drink anything cold although I was dying for a cool drink of water. Sometimes you just want something cold to soothe your throat, or cool you down. Heaven forbid in Nepali culture! I used to be so sick growing up, always had a cough or cold. Never had any soft drinks for the longest time. My friends would tease me saying if I’d drink Coke/Pepsi if they warmed it up for me.